If you ever saw Concussion, a film about a Nigerian (played by Will Smith) who discovered the brain damage that affects football players, then you should be familiar with the name Bennet Omalu. A graduate of medicine from the University of Nigeria, the 49-year-old man served his country for three years, but left Nigeria with a scholarship after political turmoil during the 1993 presidential elections. In 1994, he completed his fellowship at the University of Nigeria. Washington. In 1995, he moved to New York where he made his residency in anatomical and clinical pathology at Columbia University. 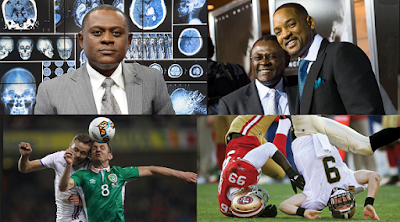 Omalu began to gain recognition when, in 2002, he performed an independent autopsy on Mike Webster, a Pittsburgh Steelers player who had chronic traumatic encephalopathy (CTE). CTE is a trauma to the head that causes a person to experience hallucinations, mood swings, dementia, depression, and suicide. He proceeded to publish his findings in a Journal of Chronic Traumatic Encephalopathy in a Player of the National Football League. However, this progress was minimized when his colleagues in the field did not recognize his findings and described it as a failure. In 2006, he discovered that a former NFL player Terry Long had died in a similar condition and had "90-year-old brain with advanced Alzheimer's." Undeterred, he presented his findings, in 2007, to the NFL commissioner, Goodell, who dismissed it. It was not until 2009 that the NFL started watching the link. In 2011, he discovered that war veterans also suffered from CTE. In 2016, his discovery was recognized. In addition to being a co-founder of the Brain Injury Research Institute, the professor at the University of California is the author of The truth has no side: my alarming discovery about the danger of contact sports and hard play, young people: football Dementia, depression and death.